Outside, Jezebelle arrives and questions the need to bring Flash into the issue at all. 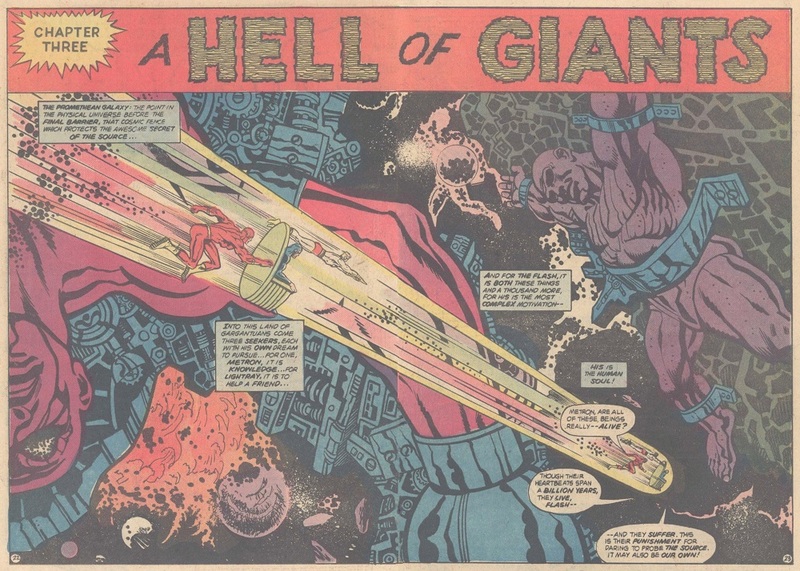 But the conversation is interrupted as Flash is forcibly ejected from inside the giant. Metron realizes Orion must be under attack and connects with his brain. His connection reveals only two images: Darkseid and the legendary Promethean Galaxy. This leads us into a flashback as the gods of New Genesis have conveniently returned to the world on a break from their Earth mission. (Who's guarding their charges there? Don't worry about it because it's not important here! Much like the history of Hawkman, so much of DC continuity just hurts your head if you think about it too hard, so just go with the "everyone decided to take a break from that ongoing narrative.") A water demon pops from the fountain in New Genesis and attacks Orion. This event is made quite clear by expository dialogue from Lighray himself. The demon is a powerful foe, but not more powerful than Orion's Astro-Force. Orion takes a hit but blasts the demon back. Yet in the aftermath, he feels weak. But he refuses medical care as the heroes return to Earth to take back their charges. Yet he never reaches Strategic Air Command, instead collapsing in the desert where he starts to grow in size. The other gods use their power to hurl him into space before his growing size destroys the Earth itself. (All of this is covered in expository captions, as Arvell doesn't bother to show anything but him outgrowing the planet.) Metron rushes to recruit Barry Allen's aid. When the Flash finds the god knows his secret, he trusts him and agrees to help Orion, thus ending our flashback. The heroes know the secrets like in the Promethean Galaxy and that strange realm exists next to the final barrier (the structure that would come to be known as the Source Wall in later years). Flash's mortal nature makes him able to pierce the barrier, something Darkseid swears he cannot allow. He sends a new villain to face off with the heroes, Hagdar the Mad, who really looks like he's ready for an appearance in the Voltron cartoon. The Voltron Force would have some problems if this guy ever replaced Lotor. This book's most momentous pages come with an impressive double page spread that first introduces the ideas of the giants that would later be embedded in the Source Wall itself. These giants float trapped in chains through the Promethean Galaxy, ancient beings that move at a pace far slower than mortals or New Gods. Their punishment came from wanting to probe the Source, a punishment Metron warns they may soon face. Metron also reveals that he accepts his own limitations. While his quest for knowledge is otherwise unbounded, he has never traveled into the final barrier to find the source. "I am a scholar, human, not a martyr," he declares. Things get crazy with the Promethean Giants. Before their conversation can continue, they are attacked by space trolls, guardians of the final barrier. Metron and Lightray swear to hold them at bay while Flash continues, as his mortal mind may pass where no godly mind can. Hagdar the Mad sees him leave, and swears to follow, perhaps proving why he's called "the Mad." Flash hits the edge of The Source, here betrayed simply as a cloud like structure. Here he finds time moving backwards. He uses his own powers to break free of time as he did in the past, swinging himself through the barrier and toward the Source. Here he meets Hagdar however and the mad god challenges him to battle. Hagdar reveals a bit of his own history, revealing he's part of a warrior race conquered by Darkseid years before. Their battle sends them hurdling towards the Source and another time barrier. Hagdar tries to use his axe to force Flash into this time sink, to be lost forever. Flash uses his powers to make a barrier of absolute vacuum around himself and repels the weapon. The axe rebounds into Hagdar and hurdles him back into the previous time barrier, where he's locked in an unending scream of agony. Free to continue, the Flash ping pongs himself off asteroids and sends himself flying into the Source. Meanwhile Metron and Lightray have felled the space trolls. Flash suddenly returns, carrying a blaster rifle of unknown origin, designed hopefully to cure Orion. Flash remembers little of his time on the other side of the wall, not even how he gained the weapon. They travel back to Earth where they right Orion's change. This draws the fury of Darkseid not simply towards the New Gods but towards the Flash as well. He swears vengeance against the mortal hero. Metron's own hopes of studying the strange weapon crumble with the weapon's sudden transformation to dust as the tale comes to a calm, foreboding end. 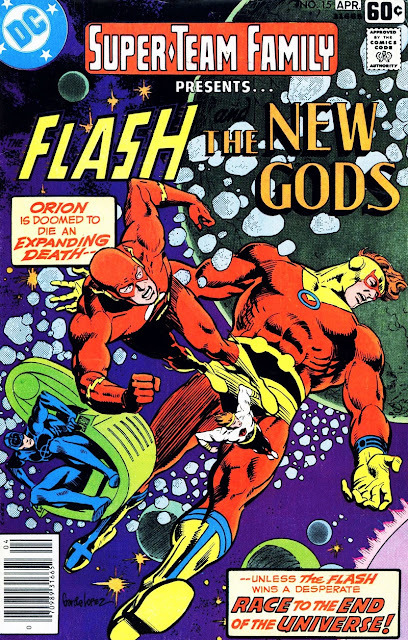 Despite not having the artistic skills of Don Newton or even Rich Buckler in tow, Gerry Conway clearly showed that he enjoyed the concepts behind the New Gods here, even as he expanded them beyond Kirby's original work. Arvell Jones handles everything with a solid if not particularly noteworthy style. The study of the nature of the Source within these pages would be picked up on by later writers and expanded into the concept of the Source Wall. That's still a few years removed however. Despite waning sales, Mister Miracle and Return of the New Gods aren't done yet. Next time around, we return to one of those two titles with "Ethos is my judge!" See you then!